Take control of your student loans with a Student Choice Refinance Loan from DCU. You'll be able to refinance and consolidate your private and federal student loans into one manageable loan, setting up one convenient payment, and potentially saving thousands of dollars in interest rate charges. Featuring a competitive interest rate, our refinance loan can help you simplify your life while amplifying your funds. NEW! Find My Rate Feature: You now have the option of finding out interest rates and terms BEFORE applying for a Student Refinance Loan at NO CHARGE. And don't worry, this is a soft credit pull that will not affect the borrower(s) credit score. Find your rate now! Keep in mind that by refinancing federal student loans, you may lose certain borrower benefits from your original loans. These may include interest rate discounts, principal rebates, or some cancellation benefits that can significantly reduce the cost of repaying your loans. You now have the option of finding out interest rates and terms BEFORE applying for a Student Refinance Loan at NO CHARGE. And don't worry, this is a soft credit pull that will not affect the borrower(s) credit score. Find your rate now! 1. If your loan is subject to a floor rate (also known as a minimum interest rate) as specified in your promissory note, your rate will never be less than the floor rate. 2. Approved schools subject to change. The Annual Percentage Rate (APR) is fixed5 for the life of the loan. The rate you receive depends on your credit qualifications and the repayment term you select. All loans are subject to approval and restrictions may apply. Digital Federal Credit Union reserves the right to change rates for new applications at any time and without notice. Credit union membership and a minimum share deposit is required. Contact us for membership details. * Rates shown include a 0.25% discount for optional enrollment in automatic electronic payments. 1. Variable interest rate solution: the rate is subject to increase after consummation. Your Interest Rate is variable and may be adjusted quarterly based on the Index. Any increase in the Index may increase the APR and may increase the amount of your monthly payment. 2. The "Index" for the quarter beginning April 1st, 2019, is 5.50%, which was the Prime index published in the Wall Street Journal on the first business day of March 2019. The interest rate will not exceed 18.00% regardless of the Index. 3. Margin will be disclosed upon approval. This Margin is added to the Index to determine the calculated interest rate. 4. Current offered rates are calculated using the Index, Margin, and Floor values in effect. Your specific Interest Rate, Margin, Floor, and/or credit approval will depend upon the student borrower's and co-borrower's (if applicable) credit qualification. Applicants may apply with a creditworthy U.S. co-borrower which may result in a better chance of approval and/or lower interest rate. 5. Fixed interest rate solution: your interest rate is fixed and is based on your credit qualification and the repayment term you select. Your actual rate within the ranges stated will be disclosed upon approval. 5 year loan term: with a 8.75% APR, the monthly payment will be $1,031.86. Finance charges will be $11,911.72. 10 year loan term: with a 9.25% APR, the monthly payment will be $640.16. Finance charges will be $26,819.91. 15 year loan term: with a 9.75% APR, the monthly payment will be $529.68. Finance charges will be $45,342.94. 5 year loan term: with a 8.25% APR, the monthly payment will be $1,019.81. Finance charges will be $11,188.60. 10 year loan term: with a 8.75% APR, the monthly payment will be $626.63. Finance charges will be $25,195.60. 15 year loan term: with a 9.25% APR, the monthly payment will be $514.60. Finance charges will be $42,628.00. 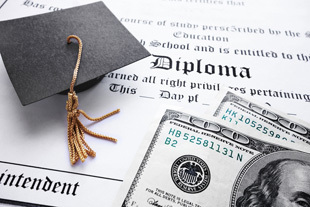 Student Loan Refinancing Program is rated 2.7 out of 5 by 3. Rated 4 out of 5 by Brendan from Low Rates, but Slow Setup You have to provide a ton of information up front before seeing your rate. You also have to have a hard credit check done before they lock in your rate. But once that was done I setup auto pay and let it do its thing. I'll jump through some hoops to save a few percent over my last loan. And would much rather work with DCU, a local institution, instead of the giant bank my last loan was through! Rated 1 out of 5 by swils from Not for Associates Degrees Doesn't say anywhere on the website or in the details that loans for Associates degrees are NOT eligible to be refinanced with this loan. Heads up, Associates degrees are not eligible. Do I need to be resident of MA or Georgia to be a member? and ultimately to qualify to apply for student loan refinancing? See this page for membership requirements: https://www.dcu.org/infodesk/membership/eligibility.html I'm not sure if you need to be a member though to get a loan through DCU. can i pay the loan off early with additional principle? When I went through the process there was no mention of a pre-payment penalty. For help with your Student Loan Refinance inquiries, please call 844-207-9917. I am just shy of a 700 credit score. Is it worth applying or do you have to have excellent credit? There are different rates available based on your personal Credit Score. To find out more information you may visit dcu.studentchoice.org, or call 800.324.1589. Hi, I am a permanent resident and I like to apply for a student loan on behalf of my younger brother who is an international student. Am I eligible for it and what options do I have.